Chiphead and torso in progress. Sixty-feet of Pepto-pink colored intestines - YUM! People always ask me, "How do you see outta there?" 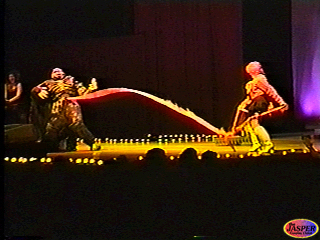 Kimberly and I decided to join forces and perform Z-RAM Bytes the Dust in 1997. This would be an unusual and daring performance, combining two characters from completely different series (yes, a cross-over skit). A sweet, innocent schoolgirl fighting a big, evil monster. Okay, we've heard this one before, BUT we wanted to twist this tale. As Eméril would say: Kick it up a notch... We decided that Hikaru would find the strength to decapitate and disembowel her opponent, without a sword. She was on a quest.... searching for her little marshmallow, Mokona - who was munched up by Z-RAM. Remember the tale of Peter and the Wolf? Mokona was tucked away somewhere in 60-feet of Pepto pink intestines, tightly wound up in Z-RAMs chest cavity. Z-RAM Bytes the Dust is an example of double entendre. A play on words, since my (David's) last name is Ramsay, pronounced "Ram-zee" (Ram-Z... Z-Ram, get it?). Z-RAM was a bio-mechanical creature, with a large, detachable microchip for a head. Five years earlier, for my senior thesis I presented a lecture of my fictional company, The Ramsay Institute, which developed smart chips, or Z-RAM chips in the year 2032. This was an extension of my future-tek college work. Bytes the Dust refers to poor Z-RAM's demise on stage. Bytes, as in computer memory. We had alot of fun with this performance, because people didn't know what to expect. Seeing a schoolgirl cheerfully rip off the monster's head, play with it, pull its guts out like a long jump rope, then proceed to dance with the dying creature... was shocking at the time. Up to this point there had not been many "skits" that combined music, choreography, horror and comedy into a linear story. The success of this performance was due to the buildup of suspense and the dramatic, unexpected turns in its theme. In addition, Comic-Con International is traditionally a Sci-fi/Western comic book convention. There were not that many anime skits to begin with, but even fewer that appealed to an audience on such different levels. We are pleased that people continue to remember our twisted performance and appreciate the hard work we put into it. 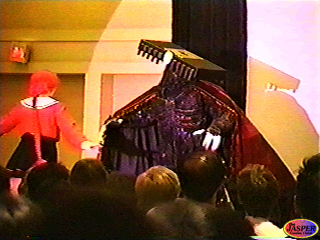 "Z-RAM Bytes the Dust" performance at AnimeExpo 1997. We won "Best of Show" for this wacky performance. 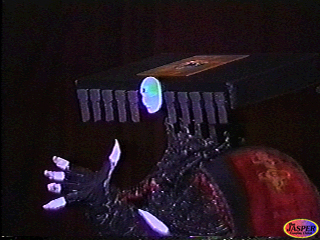 "Z-RAM Bytes the Dust" performance at Comic-Con International 1997. We won "Best of Show", and four of the nine industry awards. In the halls at Comic-Con International. Z-RAM and Hikaru-chan meet bounty hunter Yuko Moriyama (I.R.I.A.) from Zeiram. Yatta!